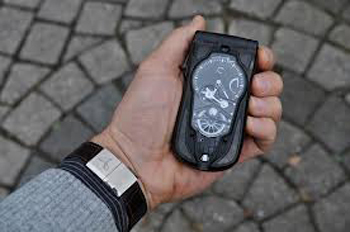 Among items ultra-luxury mobile phones mechanical Celsius X VI II I’ve always been intrigued when they appeared for the first time three years ago at Baselworld courses just to see them and see how they worked. As the Parisian brand has not been the first to make phones for Riley, he has been thinking about models that incorporate a piece of Haute Horlogerie. In this post you will find a picture of her in my hand the first model with tourbillon from 200,000 Eur am extreme objects, but they are still masterpieces of micromechanics: bread and butter of a real patient wrist! In about a month, will make his appearance in the new Basel Celsius X VI II GMT fast. The first unique feature of all these cellular mechanical, the charging system is called “Remontage Papillon”. In practice, each time it is opened for use and closed, this action gives the mechanical part of the phone a nice recharge. Here reigns an unusually high technology. With a fiber optic system the date – placed under the bar of the clock that also includes deliberately telephone functions – displays the numbers engraved on the side of the big wheel projecting a circle, making an angle of exactly 90 °. It ‘a system composed of only micro-mechanical and millions of fibers, each of which transmits a single pixel of light: the result figures are very well defined. This system called Guiding System – developed by the brand in collaboration with Schott AG company specializing in lighting and imaging – is also present in the GMT complication highlighting even more the numbers of dual time. The only mechanical part is the result of Chronode SA in collaboration with MFM. So to speak, behind the first company is Jean-Francois Mojon, the mind that has made many creations of independent watch brands like MB & F (recently Horolological Machine No.5) and the movement of mechanical-hydraulic HYT H1, Cyrus Klepcys, Harry Winston Opus, etc.. The mechanical movement built-in mobile is hours, minutes, second time zone and the display system date. Has 42 hours of power reserve, as most of the standard automatic gauges, but its unique features are the regulatory mechanism on demand and in fact the system Remontage Papillon I mentioned at the top. The latter is a device which at each opening-closing of the flip of the mobile phone gives the movement 2:23 hours of charge energy. Other details are always looking unicity the ejection system of the battery, its connector protected by a mechanical locking device, the locking system of flip bearings, but also the part phone – like its predecessor (in this article in version piece for charity) – developed by a French leader in the telecommunications sector that provides for the management software 100%, so theoretically protected from any obsolescence with respect to frequency. Completing the picture hi-tech use for the shell materials such as carbon fiber, titanium and composite fibers made from quartz that have the characteristic of being perfectly permeable to the waves emitted by the mobile phone. They are similar in specifications to carbon fibers which are made from the muzzles of the planes that incorporate antennas and radar. A Blancpain with 14 hearts to say “I love you” on Valentine’s Day!